The all-new 2014 Kia Forte 5-door SX was unveiled in Chicago and is an ultra-hot hatch sporting a new turbocharged engine and European styling. Look out for Kia as they bring out new cars like the new 2014 Forte 5-door that will compete in the global compact car segment. The all-new Forte 5-door rolled out in Chicago and immediately got the attention of those in attendance. The new Forte 5-door is lower, wider and longer and combines all new styling with the practicality of a hatchback. We knew Kia was coming out with a new 5-door hatch, but the big news is what lies under the hood of the new Forte SX. The European-inspired hatchback SX is powered by an all-new 1.6-liter gasoline direct-injected (GDI) turbocharged four-cylinder engine putting out 201 horsepower and 195 lb.-ft. of torque. The advanced powertrain features double overhead cams with dual continuously variable valve timing to help improve efficiency and performance. This new powerplant will propel the all-new Forte 5-door SX to new heights and make it the most powerful Forte from KMA to date. Kia is competing in the compact car segment with cars like the new 2014 Ford Fiesta ST that is the most popular car in Europe. The new Forte SX will be faster than the Fiesta ST 1.6-liter four-cylinder which will produce 197 horsepower and 214 lb.-ft. of torque. When its compared with the competition, it should be the fastest compact in North America. In comparison, Mini Cooper S pumps out 181 horsepower and 177 lb.-ft., while the Chevrolet Sonic RS produces just 138 horsepower and 148 lb.-ft. The new 2014 Kia Forte 5-door SX should be a popular new choice in the growing performance compact segment in the U.S. and around the globe. 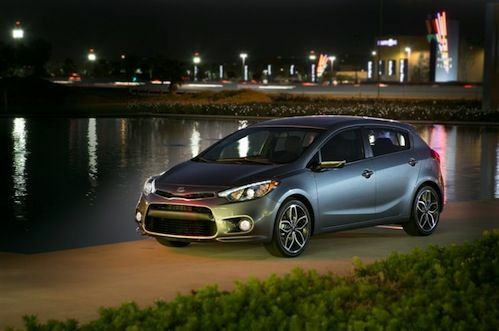 The 2014 Forte 5-door will come in two trim levels, EX and SX, and will be featured with two engine choices. Under the hood, the Forte 5-door EX is powered by a 2.0-liter GDI four-cylinder engine putting out a healthy 173 horsepower and 154 lb.-ft. of torque. The naturally aspirated EX engine comes mated to a six-speed automatic transmission. The performance-oriented SX comes with the 201 horsepower turbocharged 1.6-liter engine and offers buyers the chance to pick their own gears with a standard six-speed manual transmission, or they can opt for the six-speed automatic featuring steering-wheel-mounted paddle shifters. The combined sportiness of the SX with the useful hatcback should give the turbocharged SX a “duel-threat” in the segment. The base EX comes standard with lots of standard features like 16-inch alloy wheels, UVO eServices with rear camera display1, Bluetooth2 wireless technology, SiriusXM, Satellite Radio3, leather-wrapped steering wheel with integrated audio and cruise control buttons, FlexSteer, tilt and telescoping steering column, power windows, and LED positioning headlights with fog lights. The SX trim gets standard upgrades like 18-inch alloy wheels, dual chrome exhaust tips, and LED tail lights. Forte 5-door SX also offers an aggressive front fascia with larger bumper and grille openings, black gloss grille inserts, larger front brakes, alloy sport pedals, front and rear seats with carbon fiber-style accents. The lower front fascia and rear valance also feature carbon fiber-look trim pieces. Watch for the all-new 2014 Forte 5-door to make a global impact in the compact hatch segment. The new ultra-hot performance oriented SX is going to be one of the fastest performance compact hatchbacks on the planet. It is expected to go on sale in the third quarter of 2013 here in the U.S., and pricing will be announced closer to launch.